I was not feeling well yesterday — horrid headache — and could barely take care of myself. I had no energy to watch Ella. I was certain she would get into some horrific trouble. At one point I heard her out romping on the deck and trying to catch the Hummingbirds. I figured that meant the end of my garden, expecting whatever she hadn’t eaten to be trampled. Imagine my surprise when everything was just as I left it. Ella said, “Why would I want to eat vegetables when you had rhubarb jelly?” Since Amoeba loves the rhubarb jelly, I feared Ella had just worn out her welcome, but she didn’t eat much of that, either. I am missing a half-box of ice creams bars, though. I mentioned that to Ella and she shrugged and said she might have eaten one or two, but certainly no more than six. Then I went into my office and found my computer on and the web page for online stock trading. My credit card was right there beside it. I was immediately worried. I figured that she’d given my investment portfolio a whole new look and I’d own stock in a half-dozen peanut farms in Georgia. Ella swears the computer is exactly the way I left it. In fact, she said she spent most of yesterday on the couch. Ella had my copy of Chosen Ones from the Aedyn Chronicles by Alister McGrath. She opened the book and settled back against the pillows. “You snooze, you loose,” she said. “Now you will just have to wait until I finish.” I was going to argue when it dawned on me that reading would keep her out of trouble while I install a padlock on the freezer and hide my credit cards! If you are in the contest for a copy of Chosen Ones, The Aedyn Chronicles, by Alister McGrath, your comment on this post is worth 2 pts. — Raven — 9 pts. — Susan — 5 pts. — Nessa — 2 pts. — Jim — 2 pts. — Karen (FL) — 2 pts. — Mama Zen — 2 pts. — Melissa — 2 pts. If you think these totals are wrong, please contact me and point out the comments or actions I’ve missed. Don’t forget to Tweet today! Does your post have to reference the contest or my comment? I tweeted (which also goes to my facebook – is that extra points) but I linked right to the post. It didn’t do that @ thing. Nessa — technically the Tweet should point to the contest page: http://bit.ly/d1IKer, but I counted it any way. Only comments on my posts that mentions or displays Chosen Ones count for points. Currently you have six points and have moved into second place. A post about the contest in your blog will put you in first place. I didn’t include Facebook in the points because the only way I could check that was to “friend” everybody in the contest and I didn’t actually expect every body in the contest to BE friends. Point (he, he) taken. I will correct future tweets. And a post is forth coming. Nessa — love the pun! I wsh I could give you extra credit. Ella’s visiting! How wondeful! And she reads. Good girl, Ella! Raven – -Ella loves to read — mostly food labels. LOL! Ok. I did a post also. Nessa — it tied you for first place. Better keep an eye on that credit card, Quilly! Mama Zen – -yeah, I am sitting on it — literally! nice. this must be a really good book…and nessa sent me over. smiles. Brian — you just put Nessa in first place, for now anyway! I’d dig deeper in the sofa to check Ella’s REAL reading material. And most definitely check that credit card and computer thing. She’s pretty cheeky . . . and trunky . . . The credit card I checked thoroughly, Kelley — and Ella is reading the book. she is so excited about how big a part God plays in the story. I’m guessing I have to be American to enter again 🙁 but I’m commenting just to say I love this post, and all your Ella posts… it seems she’s a very well behaved elephant… when you’re watching. Teresa — you can enter. They didn’t put any restrictions on me, and even when they do, Canada is rarely one of them. Then I’ll have to get in some entries 🙂 Thanks Quilly. I’ll go through the stuff for it when tonight or tomorrow… so much catching up to do on blog feeds after only a day and a half of no internet!!! Yikes! Teresa — you’ve lot’s of time left yet to get those points in! Bing — I’m glad you enjoyed it. Ella is a handful but I love her. Melissa — I’m looking forward to pics of your Ella’s, too. Kala — I don’t think Raven has a Twitter account and she’s in the top running for a novel. I tweeted it today! Had to do it twice because I forgot the link (d’oh) but ah well. Susan — I already saw your tweet! I’ve recorded you on the spread sheet. things are heating up! I guess I´m the last woman then without a twitter account. Ella is adorable. How long is she staying? Betty — nope, there are a couple of others here with no Twitter account. I’ve forgotten how Ella likes her ice cream! She loved the p-nut butter cup ice cream I had for her. Ella never ceases to amaze me with her talents! I mean ELLA is so funny! Linda — Ella can be a real trial. You should invite her to visit you, and you’ll see! I like the idea of the book keeping Ella occupied and out of trouble — and in an edifying way, too! 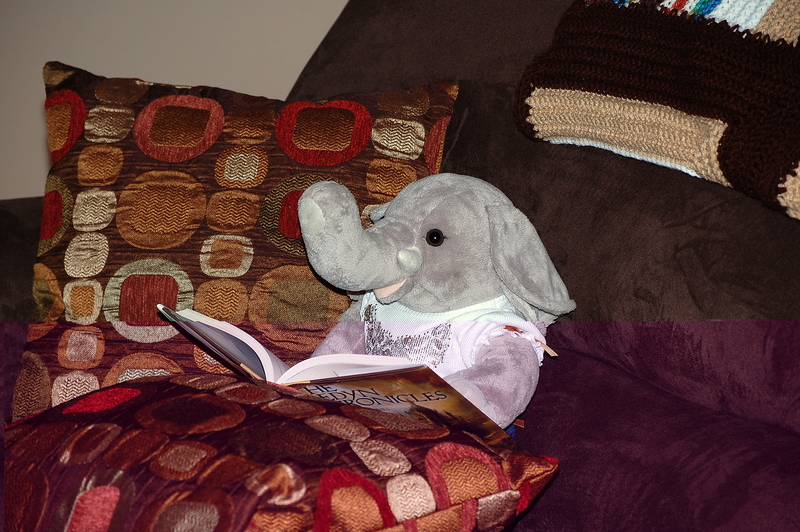 Barbara — she’s a slow reader, but it is keeping her constructively occupied. Ella is back in town! How sweet. Tell her I said hi, will you? I hope you are feeling better now and are ready for your trip. Have a wonderful time. “Don’t forget to tweet today?” Can’t we just day trade or something?